We all know what a pain it can be to get up in the morning but there are those mornings where we wake up to smell of freshly brewed coffee and suddenly the world seems a better place. 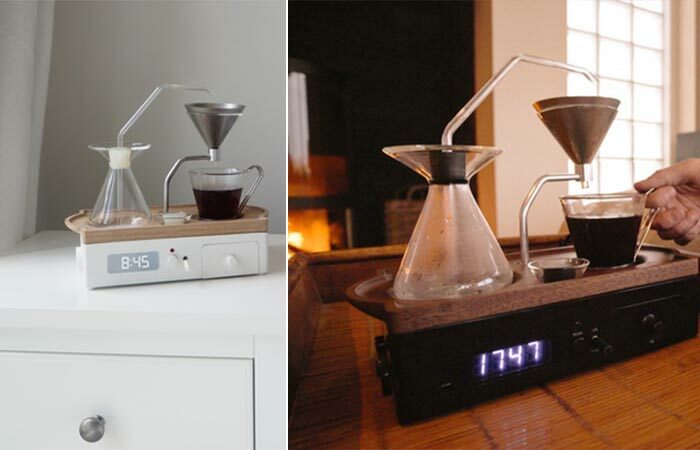 We all need our caffeine fix and luckily, The Barisieur allows you to wake up to the smell of coffee every morning. The Barisieur is unique in the fact that it is completely automatic; you simply fill it with ingredients before you go to bed, set you alarm clock and be woken up to the sound of bubbling water, exuberant aromas from either your coffee or loose tea leaf and voila, you have your coffee to start your day off with. There’s nothing like waking up to a cup of freshly brewed coffee and The Barisieur allows you to do just that. The water is boiled by means of an induction hob that heats up a stainless steel base. This allows for steam to be pressurized that forces water out of the vessel and into the filter that holds your ground coffee. The Barisieur also has a built-in milk vessel that is kept cool by a Peltier cooler and there is a sealed drawer with a removable divider for sugar, tea, coffee and other necessities. The Barisieur is packed full of features to ensure that you have a perfect cup of coffee every morning. It’s also very easy to use and all the brewing parts are dishwasher safe. Apart from all of these functions, it’s undeniable that The Barisieur looks good and adds to the décor of your room. Depending on your preference, you can purchase The Barisieur in white for a white room or black and walnut to go with your wooden headboard. Check out the video below. You can purchase The Barisieur in either white or black to suit your decor. At the moment, The Barisieur is busy with a Kickstarter campaign and they are reaching their goal with ever increasing speed. 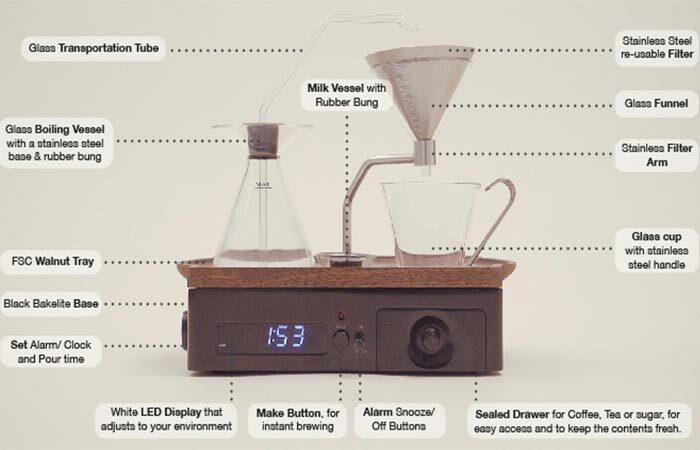 So, if you want to have your very own coffee-making alarm clock, you should check them out for early bird specials.